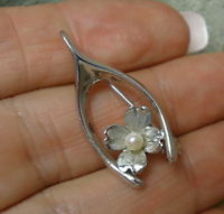 Dainty WISHBONE Pin with small Pearl Dogwood Blossom in Sterling Silver - Harry S. Bick. Marked STERLING HSB. Measures 1 1/4 inches tall. WEAR A LUCKY PIN!!!! ...... Also enjoy FREE SHIPPING with delivery confirmation (tracking number). ...... Please contact seller before ordering from Canada. ...... Thank you for shopping at quadrina!!! !